Unexpected crashes, spontaneous reboots, poor performance, sleep and hibernation issues - buggy drivers are a major cause of all kinds of PC problems. And so updating them occasionally can deliver very real speed and stability benefits. You could try to do this manually, sign up for endless newsletters, and make daily visits to your hardware manufacturer's websites, waiting for the latest driver releases to appear. But if you prefer an easy life then it may be a better idea to get in some third-party help. 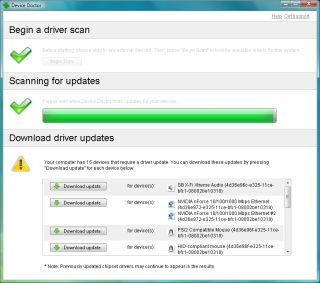 There are now plenty of utilities that will scan your PC for installed drivers, report on any that have updates available, and in some cases even download and install them for you, at a click - much more convenient. This ease of use can lead to problems, though. What if the program downloads the wrong driver, or messes up the installation process? It's important to choose your driver update tool with care, then, so to help you out we've been running some intensive tests - and the following programs are our current top five. The free version of DriverMax quickly scanned our test PCs, correctly identified their outdated drivers, and displayed this information in a rather limited browser-based report. There's no option to simultaneously download all the drivers you need - and, in fact, a free DriverMax account only entitles you to a couple of downloads a day - so you'll probably have to choose the drivers you'd like to update first. A click on the Download link takes you to a page with more information on your selected driver, and messages from other DriverMax users relating their experiences with the update. Which can be a little worrying, if they're relating some PC disaster, but on balance is still a good thing: this public feedback brings a transparency that you don't get with other products. A couple more clicks and our chosen drivers were queued up, downloaded and installed faultlessly. The DriverMax interface isn't too great, then, and the free version has more than its share of restrictions, but the program delivered when it mattered, correctly identifying out outdated drivers and reliably installing their replacements. Factor in some useful driver backup and restore options and DriverMax is definitely worth a look. Driver Genius Professional features a clean and clear interface that makes it very easy to use, and we quickly had the program scanning our system for update issues. After a very speedy checkup, little more than 30 seconds, it returned with a detailed report on our drivers. This missed a couple of lesser updates on one system - a "USB 2.0 card reader", and an "HID-compliant mouse" - but successfully noted everything else. A click on the Download All button and Driver Genius Professional quickly grabbed the files we needed. We then clicked Install, and after accepting the program's sensible suggestion to back up our existing drivers (which then unfortunately took an extraordinarily long time), it unpacked the downloaded drivers and launched the setup program. This wasn't an automatic process, as we had to work our way through the usual installation programs, but there were no great complications and our system was soon updated. Future upgrades might not be as successful, because by default Driver Genius Professional won't check for a new driver database. If you don't notice, then you'll constantly be checking against the older database, and so never find anything new. This can be fixed by changing a setting in the Options dialog, though, and the program then works more as you'd expect. We had a few issues with Driver Genius, then, but on balance its ease of use, accuracy and focus on backups and keeping you safe means the program still earns a thumbs up from us.